The new Emergency Complex & Trauma Centre having a covered area of over 1 lac sq. 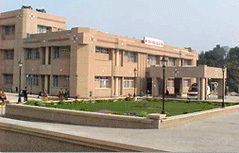 ft., was inaugurated on 24th December 2003. This new centre is not simply a change from the old building to the new one. It is a major shift in the concept. It is a self contained unit wherein all the requirements for complete trauma and emergency services are available under one roof. After OPD hours, patients will be attended to in this centre of the hospital, which will function round the clock on all days throughout the year. There are 150 beds and 10 operation theatres (5 major and 5 minor) for general surgery, orthopedics, neurosurgery, plastic surgery and gastointestinal surgery. Twelve ambulances are commissioned to transport patients within the campus, totally free of cost. All types of emergency and medico-legal cases are attended to and admitted if neccessary. The centre has all investigative facilities including CT scan, Ultrasound, X-ray, Mobile X-ray and Portable Ultrasound, Pathology and Biochemistry Labs having autoanalysers. Except for Cardiology, Psychiatry and Obstetrics & Gynecology, emergency admissions to all departments are now made through this Centre. Average number of cases seen daily are 110 and average number of admissions through this centre daily are 70. At the initiative of the Hon'ble Vice Chancellor, Prof. Hari Gaqutam a new Trauma Ventilatory Unit was inaugurated by Hon'ble Chief Minister Shri Mulayam Singh Yadav on 4th December 2006 . This unit is a great boon to trauma victims. Beds are always occupied here and all facilities such as blood gas testing are available. On admission to the hospital the patient (except destitutes) has to pay Rs 35/- as admission fees. Two attendants are allowed to stay indoor with each patient. Free medicines and investigations are available to poor and destitute patients through the K.G.M.U. Welfare Society. This society also manages drug distribution centre at which drugs and consumables are available round the clock at 32% discount on MRP.